January 18, 2016 – This week, we’re flying our time machine across the Equator and into South America’s turbulent past, where we’ll meet some colorful characters, present at key moments of its history. They include Pablo Escobar, Butch Cassidy, Sundance, Charles Darwin, and a 14-year-old girl, Juanita, who the Incas sacrificed atop a twenty-thousand foot volcano. Our tour guide to the Andes is author and filmmaker Kim MacQuarrie, who has won four Emmys for his documentaries. 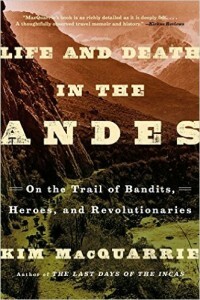 His latest book is Life and Death in the Andes: On the Trail of Bandits, Heroes, and Revolutionaries . You can follow him @KimMacQ on Twitter, and learn more about his work at KimMacQuarrie.com. The F/X channel is developing Kim’s previous book, The Last Days of the Incas , into a 13-part TV series: Conquistadors. Other books we discuss include Candice Millard’s epic Amazon history: The River of Doubt: Theodore Roosevelt’s Darkest Journey .